probably for the best if Biff doesn’t have kids. I think you meant “Jupiter”… Saturn’s density (& thus, it’s gravity) is so low that if there was a large-enough ocean, it could float on water. …& HOW could they EVER be next to each other???!? one pair would always be on the ceiling, the other pressing divots into the carpet! DMC_Run, that is incorrect. Acceleration due to gravity is determined by the mass of the object in question and how far away it is. Density does not really matter. Also, Jupiter, being a gas giant as well, probably has a density similar to Saturn’s anyway. Either way, that just looks so.. very.. painful. Hey, here’s a thought: what if Biff’s shoes broke through both the ceiling and the floor at the same time? Would he float in midair, or would it be more of a CRUNCH “Ow.” situation? Mike, I’d say that Biff would be the first human to experiment binary fission. I think that particular position has won Biff a Darwin Award, for ‘removing himself from the gene pool’. A thought occurs (supported by the eyebrows): Biff isn’t a tragically impulsive shopper, but rather a completely insane inventor like Lao Kang the Mad. He’s had every part of his body mutilated.. I don’t think a little overextension is gonna phase him. Calthin, Biff can still have kids? Ow… How come his pants didn’t rip? Perhaps Biff’s children, assuming their conception is still possible, would be better off having a parental figure who teaches from experience. Biff himself doesn’t seem to learn much. Jupiter, for one, has a gravity of over 2.5 times Earth’s, if I recall correctly. Given the situation, Lucy UNDERGROUND with Diamonds. Biff doesn’t really look that uncomfortable. Instead, he looks more like he has an “oh shnitzel, how am i going to get out of this one” expression. What if you put the uber-grav boots on OVER the anti-grav ones? Would that make you have normal gravity, make you float, or turn you into a duck? Ya’know there’s a difference between anti-grav and reverse-grav, right? At least he doesn’t have sideways gravity boots! -Cricket, cricket- I can hear you breathing out there. I’m just giggling at his pose. I so want Biff’s boots! …thus undoing the ‘shrunk pants’ problem. Biff does too seem to learn from experiance… have you seen him do the same thing twice? Its forethought and planning that he lacks. Biff doesn’t need to have kids. He is immortal, and thus, I think, he’ll never get old, either. There’s nothing wrong with my logic ( I know I spelled that wrong), you’re only seeing things. Diamonds aren’t that dense, they’re just hard… In fact, the cubic structure makes them less dense than graphite, I think. Diamond-based pencils would ruin a lot of paper, though, unless you used a lot of wax… Hey, that’d be cool. In response as to why he needs gravity boots, It’s for when ne doesn’t pay his gravity bills. Now which ones did he mean to put on? Not entirely true. Jupiter’s mass is around 350 times Earth’s. Its gravity is around 2.5 or 3 times Earth’s. Low density is another way of saying most of the object’s mass is farther away. You couldn’t kick anybody. 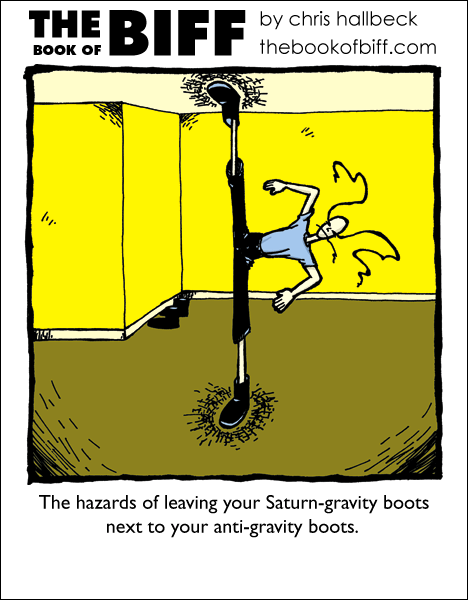 The Saturn Gravity boots cause your feet to be immovable from the ground, and if you kicked with the anti gravity boots on, you would just go into a constantly repeating flip until you turned them off. Also, Gravity is a product of Mass, not Density. Saturn’s gravity is only 1.064021315*Earth’s gravity… They wouldn’t have much effect, these boots. Also, gravity is proportional to mass and inversely proportional to the square of distance… Density is more appropriate than mass, but neither are particularly grand. I rescind my original statement. Upon reviewing my facts, Density is the main part of gravity. E.g., A black hole? Super dense, super massive, low volume? High density=high gravity. I know that would hurt me, ooooooooh…. Maybe next time, Biff, you should put your saturn boots in the closet. Will anyone reply to my old comment as MetMan that states that anti-grav is not reverse-grav necessarily? The gravity relative to the Earth of Saturn is .916, so the saturn-gravity boots would actually make him weigh less, but not as much less as the anti-gravity boots would, but DMC_Run was right, density is relevant to gravity (and it’s low density is only because the atmosphere is 97% Hydrogen and 3% Helium, and so much of Saturn is atmosphere that even the extraordinarily dense core only brings the average density to .678g/cc), Saturn is about 95 earth masses, and with the large radius, the d^2 murders G. The anti-gravity boots wouldn’t be negative gravity (as shown in pic) but would most likely put Biff in a state of micro-gravity, or approximately 0Gs; similar to Joanassie’s point. Und thus, Biff has discovered the dreaded UNIVERSAL SPLIT.